The cultivation and consumption of basmati rice dates back thousands of years in India and South Asia. 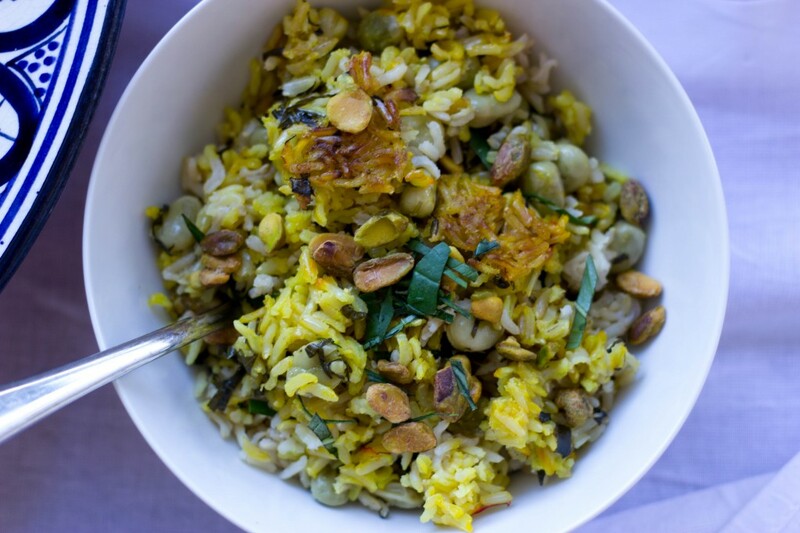 It has a rich history as a staple of Indian and Middle Eastern cuisine and has a nutty, butter-like flavor. Unlike brown rice, basmati has been stripped of it’s bran layer, thus making it very easy to digest. This stripping does remove some of the rice’s fiber and inherent nutritional properties however. Because it contains less starch than other white rices, it will not significantly spike your blood sugar and is ideal for those with diabetes. Think of this dish as a meal that you gift to yourself. In traditional Ayurvedic cuisine, “Basmati rice builds body tissue and is very high in prana [vital life energy],” says Vaidya Ramakant Mishra, former director of product research and development at Maharishi Ayurveda Products International. At the risk of sounding like I’m smoking something, we love anything that promotes life, energy and nourishment. 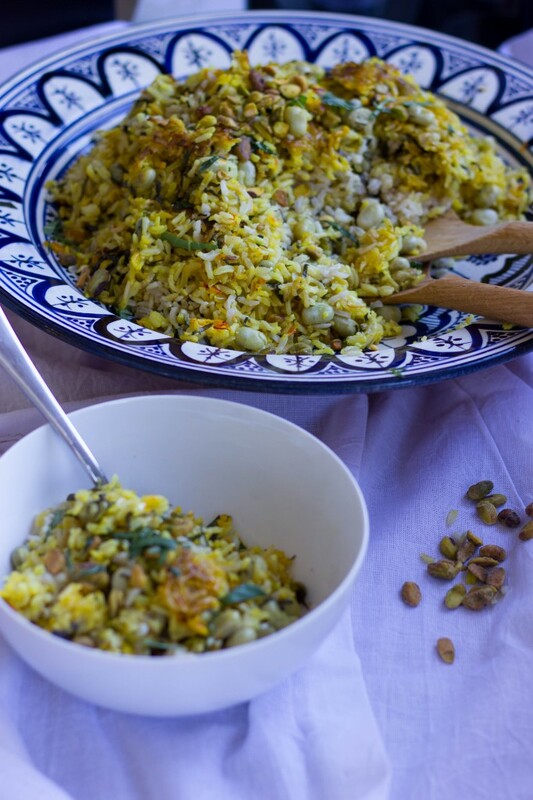 With a vast history that is deeply ingrained (ahem) in the growth of so many ancient cultures, rice dishes such as this one should grace our dining tables often and with pride. Rinse the rice well in a colander. Bring 3 cups of water to boil, and cook the rice uncovered for 10 minutes on medium high heat, stirring occasionally. Then add the fava beans, stir and continue to cook uncovered for 8 more minutes. In a separate small bowl, crush the saffron threads and add 1/2 c. of hot water and let the saffron soak. When the rice and fava beans have cooked for 8 minutes, drain in a colander Set aside 1 and 1/2 c. of the rice and fava bean mixture and put the rest of mixture back in the pot if you drained it, then add the basil. 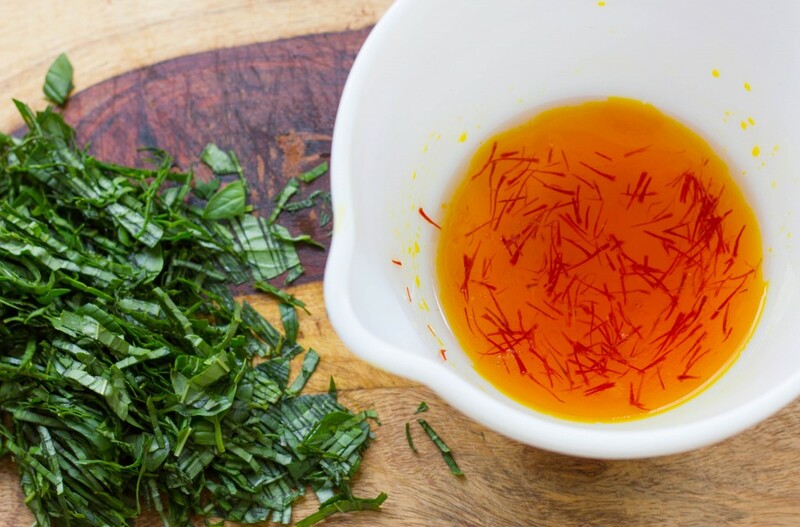 In a bowl, combine 1/2 c. of oil, half of the saffron water and the mixture that was set aside, and stir. In the pot, layer the saffron rice evenly on the bottom (this will be the bottom crust of the rice). Scoop the plain rice and fava bean mixture on top, forming a mountain shape with the most of the rice in the middle of the pot. Put a kitchen towel on the top of the pot, and place the lid on the pot (be careful the towel is no where near the flame or heat). Turn the heat on to medium, and cook for another 10 minutes. Mix the remaining 1/4 c. oil and saffron water and a few good pinches of salt. 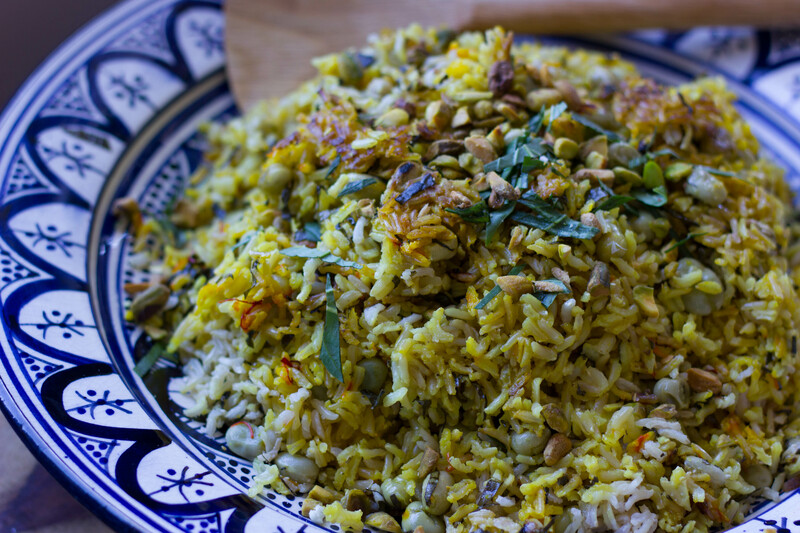 When the 10 minutes are up, pour the saffron oil on top of the rice evenly. Put the towel and lid back on the pot, turn the heat on low and continue to steam for 45-50 minutes. Then turn off the heat and let sit for another 5-10 minutes. 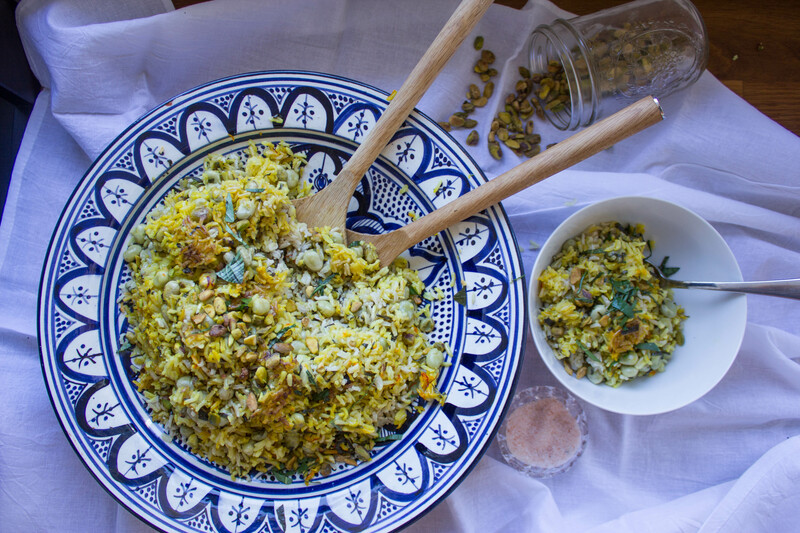 Serve and garnish with pistachios. I love your website. It is beautiful and makes me want to cook. Thanks Ronny! Let us know how the cookin’ goes!